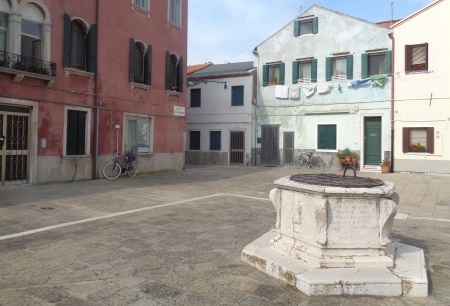 The village of Malamocco on Lido (Venice): sights, accommodation, restaurants. Buses between Malamocco and Lido. Malamocco is with about 1.000 inhabitants the second biggest village on the island Lido di Venezia near Venice, only the capital Lido is bigger. It is a great old village. It is the only place on the island that has an old, preserved town centre. Large parts of the old town of Malamocco are a pedestrian zone. For many tourists Malamocco is the biggest attraction on the island of Lido. Since Malamocco is very easy to reach by bus, the village is perfect for a short excursion from the capital of the island of Lido. There is little tourism in the village of Malamocco. 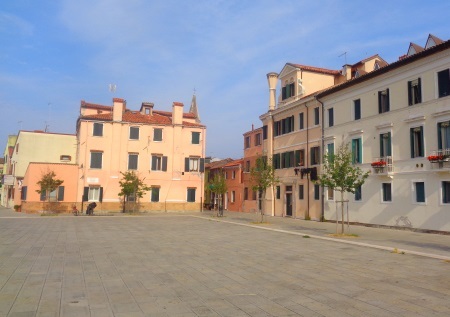 Essentially, however, it is a quiet village with several beautiful large squares. In the village there are some small taverns and cafes. Villagers are still interested in the strangers. One quickly gets into conversation, especially if one speaks Italian. 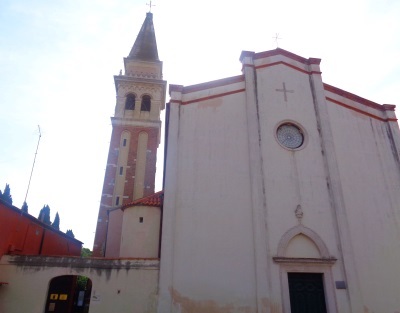 The most striking building and the most important monument in the village is the large church of Chiesa di Santa Maria Assunta. The present church of Malamocco dates back to the 15th century. Before that, there was another church on the site since the 11th century. The town of Malamocco was much more important in history than it is today. In the 19th century it was still the capital of the island of Lido di Venezia. The village has existed since Roman times. 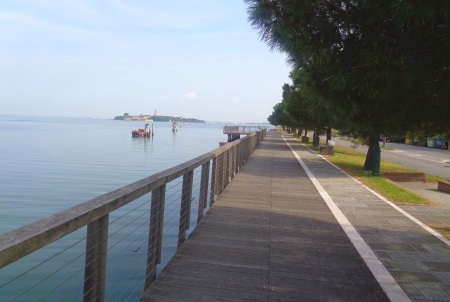 A few meters outside of Malamocco is the shore of the lagoon of Venice. Here the locals have created a beautiful promenade for pedestrians..
Is a trip to Malamocco worthwhile? A short detour to Malamocco is a good idea, just because the journey is so easy (see bus below). It is a great change to the northern part of the island Lido with big hotels and crowded beaches. It is the only old place on the island of Lido di Venezia worth seeing. Malamocco is easily accessible by bus. The bus stop is on the main road directly by the sea. From the bus stop it is only about 100 meters to the center of the village with church and pedestrian zone. During the season, the buses on line A run every 10 minutes in both directions during the day. 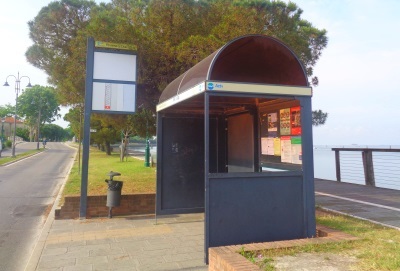 The bus line starts at the Lido Santa Maria Elisabetta ferry terminal. Public water buses arrive here every few minutes from Venice. The buses wait directly in front of the harbour. The best way is to take line A to Malamocco (journey time about 10 minutes, departures about every 10 minutes). Those who have a day ticket for the Venice water buses can use the buses free of charge. Whether the ticket is valid or not can be seen when getting on the bus. If you hold the ticket against the device, a green light (valid) or red light (invalid) appears. Bus tickets to Malamocco can also be bought at the ferry ticket counters (about 1,50 Euro simply in 2019).. The buses of the line A go to Malamocco further to the south of the island Lido to Alberoni. They end at the port for the ferries to the neighbouring island of Pellestrina. A bit rarer bus line 11 goes to the ferry to the neighbouring island. On the left of the map by the sea is the bus stop "Malamocco Centro", opposite the street begins the old town. If you are looking for a quiet, beautiful village and still want to get to Venice quickly, a hotel in Malamocco is the right place for you. Our recommendation is the Relais Alberti directly opposite the church described above (address: Campo della Chiesa 3). The hotel is located in a well renovated 15th century building. Many guests praise the friendly staff and the very good breakfast. You can book the Relais Alberti Malamocco on this page at Booking.com. We also recommend Ca Del Moro, a few hundred metres from the historic centre of Malamocco. If you want to enjoy good, classic local cuisine in the village, you should go to the Tratorria da Scarso. The guesthouse is almost directly at the entrance of the village, if you come from the bus stop or from the sea. Highlights in the Locanda da Scarso are fish, seafood and meat. For Venice the tavern is very cheap, you should definitely try the black spaghetti. (Opening times approximately from 12 o'clock to 21:30 with lunch break from 19 to 21:30, Mondays only at noon, all info spring 2018). Another restaurant with good, local food is the Al Ponte di Borgo in the back of the village (as far as we know Monday closed, early 2019).